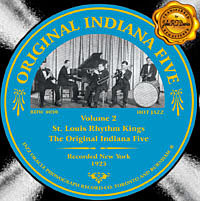 The second of four volumes by this prolific jazz band, including rare sides made for Gennett in 1925. Liner notes by Mike May include newly-found information on the band members. Mickey Bloom (t), Pete Pellizzi (tb), Louis Maesto (cl), Nick Moleri (p), Christian Maesto (d). Maggie Jones (v), accompanied by the St. Louis Rhythm Kings, personnel as above. Tom Morton (d) dir. James Christie (t), Pete Pellizzi (tb), Nick Vitalo (cl,as), Harry Ford (p), unknown (whistle) where shown. Tom Morton (d) dir. James Christie (t), Pete Pellizzi (tb), Nick Vitalo (cl,as), Harry Ford (p). Same personnel; someone probably doubles on piano on track 22.